It was pointed out that Aotearoa New Zealand has signed up to the United Nations Sustainable Development Goal to halve child poverty by 2030, but there seems no clear plan for how to do this. The three speakers proposed a tool to help, which is a newly created Covenant for our Nation’s Children, already agreed to by our nation’s iwi (tribal) leaders, and ready for the rest of us to embrace. How might we better involve the communities we serve in grant decisions? 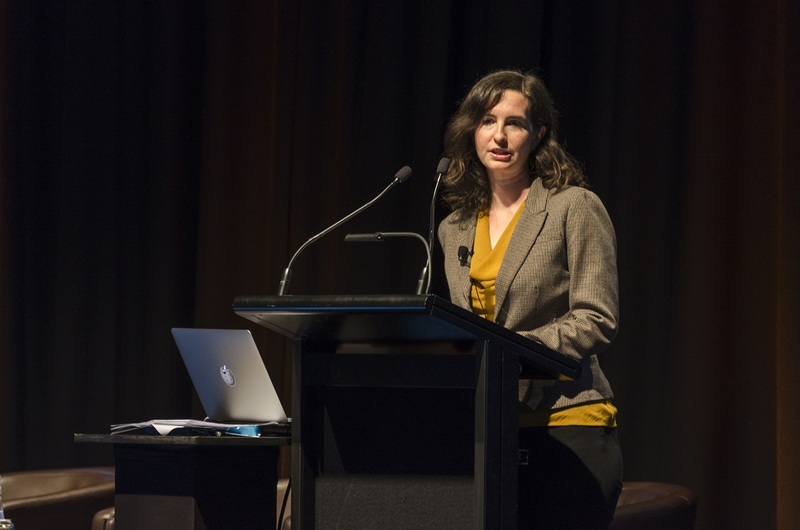 Katy Love from Wikimedia Foundation shared her experience of “participatory grantmaking” and “radical transparency” and challenged us to be more open and inclusive in our grant-making. “Nothing about us without us”** is a good starting point. 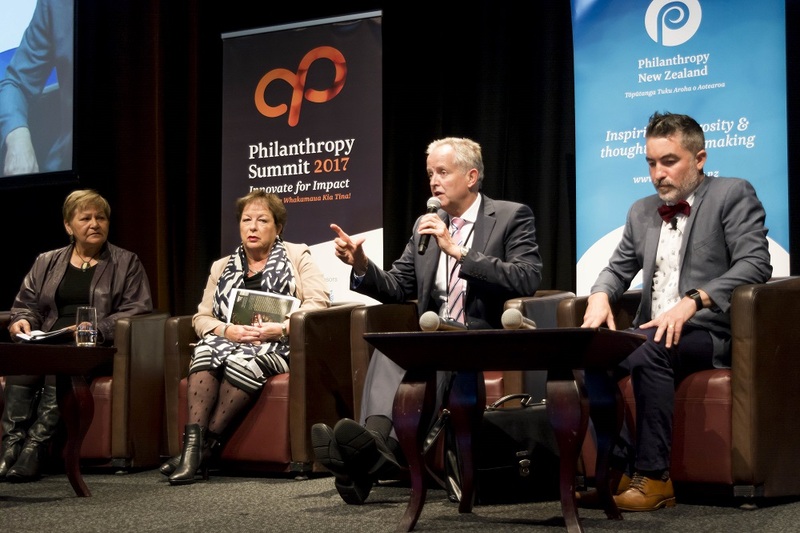 What role should business play in philanthropy? Vodafone New Zealand’s Antony Welton, Microsoft’s Michael Brick and Australasian supermarket chain, Countdown’s James Walker challenged the business sector to turn around the recent drop in business giving, pointing out that supporting communities is both the right thing to do and is good for building brand and motivating staff. What does self-determination and transformation look like in Māori communities? Donna Flavell, CE of Waikato-Tainui shared her tribe’s journey in their mission Kia tupu, kia hua, kia puawai – to grow, to prosper, to flourish.Although the process of righting historical land confiscations and wrongdoings has so far taken more than 130 years, and although the $170m dollar settlement was a fraction of what was lost, the iwi is indeed flourishing both economically and socially; “But it was the apology for past wrongdoings which mattered most”. How do we address power dynamics in philanthropy? Akaya Windwood from the Rockwood Leadership Institute reflected that communities can make change without philanthropy, but philanthropy needs someone to give to in order to contribute to change. Why then, do the power dynamics go the way they do? Rather than sitting in judgement, shouldn’t we be in service of our community? Akaya asked those of us who sit in the board rooms determining funding to ‘find our hearts and change our minds’. What does courageous philanthropy look like? CIVICUS Secretary General Dhananjayan (Danny) Sriskandarajah challenged us to defend civic freedom, to stand up for voice, to embrace diversity, to give up control and to dream big. ‘How have we built a global system where eight men own more wealth than half the world?’ he asked. ‘For thousands of years we lived as subjects, more recently as consumers. Now is the time for participation, for empowerment.’ Danny’s challenge was to make the 21st century ‘the Century of the Citizen’. The final word goes to the opener of the Philanthropy Summit 2017, the honourable Alfred Ngaro, Minister for the Community and Voluntary sector. Minister Ngaro reflected on Philanthropy New Zealand’s Chair Sandra Kai Fong’s comment that if the conference theme was “Innovate for Impact”, then the acronym for our conference is IFI, or, perhaps, “if I…”, and said that is our call to action. If I reflect deeply on the learnings from this conference, and if I use the knowledge and tools gained to innovate, seek impact and contribute to positive change, what might be possible for our world? * This post was written for and first published in the international philanthropy magazine Alliance – view the original here. ** Katy Love noted that “Do nothing about us without us” was first used for disability activism during the 1990s.